Flyboard with Extreme Aqua Sports, LLC. Welcome! We are Extreme Aqua Sports, LLC! 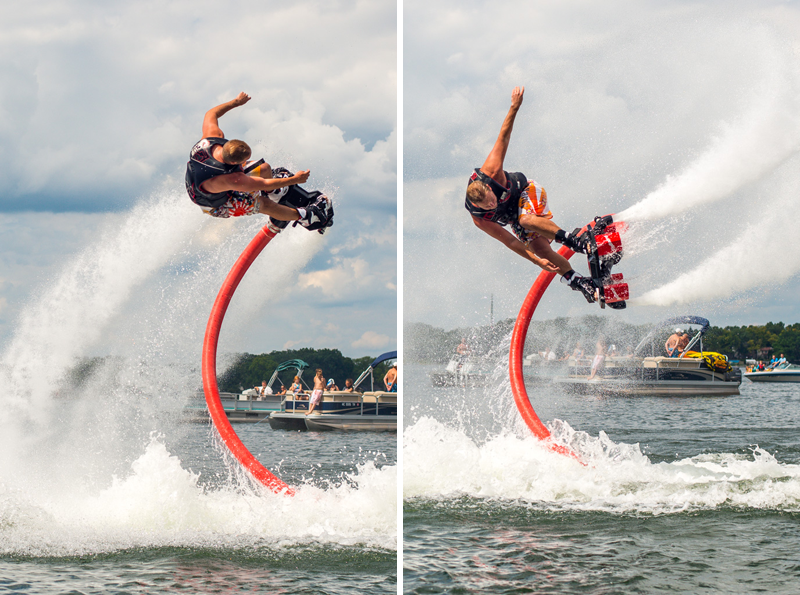 Extreme Aqua Sports provides Jetblade, Flyboard, Hoverboard and Jetdeck rental at Michigan's lakes during the summers and Florida's coast during the winters. If you haven't experienced the thrill of free flight before, book your flight and try it now! It's a thrill you'll never forget. Best of all? You'll be flying within your first session!? A jet ski's jet is linked to a 65-foot hose which feeds water into the Jetpack. The hose directs water into the center of the pack where it then gets diverted out of jets to each side creating two streaming jets of water. The flyboarder then goes for a flight! Click on the "Videos" link on the top left of this website to see for yourself! The best part of hydro flight that it is intuitive and easy to learn! We've managed to get everyone we've taken flying within a 30 minute session, usually within 5 minutes. It's not unusual for someone to get it right away! A 30-minute session is $100. A full day is $1500. Okay, I'm sold. How can I try this? We'll be in Michigan during the summer and Florida during the winters. Don't hesitate to contact us if you have any questions! Like our Facebook page for frequent updates, videos, and events!